One of our Rochester paving crews completed this project at Collett Woods Townhomes. While the townhomes are managed by the SB Ashley Group, Ruston Paving was working indirectly for them through Redman Construction. 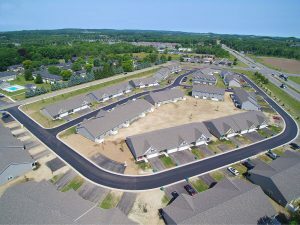 These new townhomes were started in 2016, which is when we installed the binder course. This week we were finally able to install the top course. The project called for a cool 550 tons of surface mix. Our crew started at 7 am sharp; and, they were swept up and offsite by 4 pm, leaving behind a mat that looks like glass and a center seam as straight as could be. If you look closely at the picture, our office can be seen in the distance – our blue equipment is hard to miss!